Lightly grease a 900g loaf tin with a little soft butter. Place the flour, yeast and salt in a large bowl and combine thoroughly. Make a well in the middle and pour in 425ml lukewarm water. Gradually work the flour into the liquid with both hands until the mixture comes together to make a ball of dough that leaves the sides of the bowl clean. Turn the dough out onto a lightly floured work surface and knead for 10 minutes. To knead the dough, first use the heel of your hand to stretch it away from you, as if pulling out a rubber band, then gather it back into a ball. Turn the dough around and repeat the process until it feels very elastic and silky-smooth. Pat the dough into a rectangle the length of the tin. Roll up the dough from 1 short end and pinch the seam to seal it. Place the loaf in the tin, seam-side down. Place the tin in a large plastic bag, inflate the bag gently and seal the end. Leave to rise , or 'prove', until doubled in size - about 1 hour in a warm spot. Towards the end of the proving time, preheat the oven to 220°C, gas mark 7. Remove the tin from the bag and bake in the centre of the oven for 35 minutes until the loaf is golden brown. 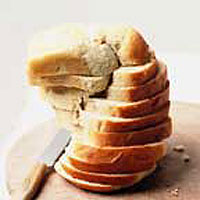 To test if it is cooked, using oven gloves, tip the loaf out of the tin and tap the underside with your knuckles. It should sound hollow like a drum. If it sounds heavy then return the loaf to the oven and bake for 5 minutes more, then test again. Transfer the loaf to a wire rack and leave to cool completely. Store somewhere cool and dry and eat within 5 days, or wrap and freeze for up to a month. Use a free-standing mixer with a dough hook to prepare the dough. Use low speed and knead for 5 minutes only, once the dough has come together.